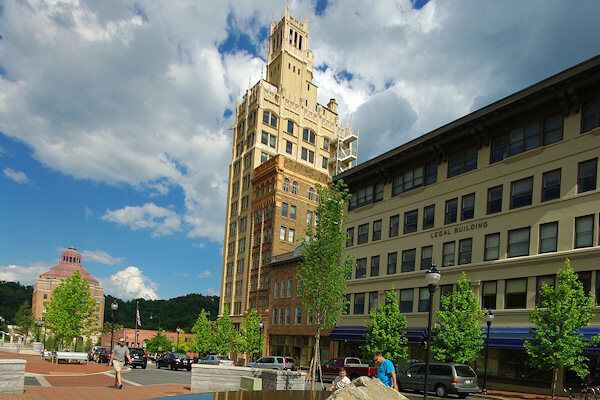 Downtown Asheville boasts a colorful and eclectic mix of architecture. Styles include Neoclassical, Romanesque Revival, Art Deco, Beaux Arts, Gothic and Spanish Renaissance, with buildings and monuments designed by greats such as Douglas D. Ellington, Richard Sharp Smith and Rafael Guastavino. Among the highlights are the Guastavino-designed Basilica of St. Lawrence, featuring what is reputed to be the largest freestanding elliptical dome in North America, the massive Grove Arcade Public Market, and Ellington’s Art Deco City Hall. A great way to enjoy Asheville's downtown architecture is via the Urban Trail. Why are there so many architectural gems in Asheville? Asheville suffered a greater financial hardship than all others from the 1929 Crash, shouldering a per capita debt burden that was the greatest in the country. Today, the liability that city carried for almost 50 years has turned it into an American architectural treasure. No, it was not New York, or St. Louis, or Chicago. The "City That Suffered Most" was Asheville, North Carolina, a municipality that was so poor for so long that ancient buildings never faced the bulldozers of urban renewal. While many cities chose to default on their Depression-era liabilities and started over with a clean slate, Asheville city fathers chose to pay every dollar back. It was a burden several generations would carry, until 1976 when the last obligations were paid. During those years the city stayed much as it was before that black day in 1929. The tax base was small enough that growth was slow, and what tax monies were generated funded more pressing needs than the destruction of old buildings. 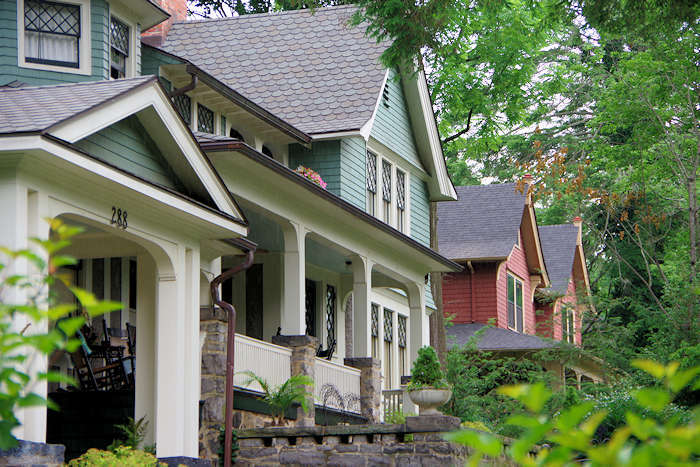 Asheville today is more than a city where architecture stood still for several generations. It is distinctive because in the year time stopped, 1929, it was a boom town, a home for the Vanderbilts, a resort for Henry Ford, Thomas Edison and other historic luminaries, and a mecca for rising young architects following in the footsteps of one of the masters, Richard Morris Hunt, who built the lavish Biltmore House in Asheville in 1895. The styles of architecture reflect the temperament of different designers, and the moods of the city at different periods. Downtown, for example, side by side tower the mountain city’s own structural odd couple -- a flashy Art Deco-style city hall, its peaking mountain silhouette veiled with a pink and green tiled octagonal roof, and, next to city hall, in sharply masculine, conventional juxtaposition, the Buncombe County Courthouse. The two structures surprisingly were completed in the same year, 1928, and were to have been designed by the same man, Douglas Ellington, who popularized the Art Deco style he had come to admire as a student in Paris. As work started on the city hall building, however, local officials decided its design was too extravagant and had someone else take over the county building project. Previously the land of frontiersmen like Daniel Boone and Davy Crockett, Asheville and Buncombe County were transformed into a resort town and a center for therapeutic health treatments after the railroad arrived in l880. Asheville became a mecca for visitors wishing for a mountain escape, its population climbing to 10,325 in l890 and its "summer people" in l886 numbering nearly 30,000. The area also attracted the rich and famous. None of its visitors left a greater impact upon Asheville than one of these influential men of the l890s who decided to build his home here--George Washington Vanderbilt, whose Biltmore Estate and 250-room Biltmore House continue to be Asheville landmarks. Vanderbilt thought Asheville the most beautiful city in the world and bought 125,000 acres of land there. He then commissioned noted architect Richard Morris Hunt to build the most luxurious private residence in America upon the property, and hired Frederick Law Olmsted to supervise the landscape architecture of the estate. Hunt modeled the French renaissance chateau after those of the 16th century in the Loire Valley in France. Indiana limestone was brought into the area by train, stonecarvers and woodcarvers contributed their artwork to the interior and exterior of the house, and Vanderbilt spent years in Europe and the Orient buying antiques and art for his great house. In l895, after five years and a million man hours of labor, Biltmore House was completed. Not only did the establishment of the estate and Vanderbilt's presence there enhance Asheville's reputation as an exclusive area, the work at Biltmore Estate also required the skill of European craftsmen. Many of these talented workmen remained in Asheville and spread their influence throughout the city in architectural projects. Another wealthy man of grand vision who left his imprint on the architectural style of Asheville was Edwin Wiley Grove, a medicine manufacturer who came to Asheville in 1897 seeking relief from his bronchial difficulties. Grove became enamored with a grand, yet rustic, mountain lodge he had seen at Yellowstone Park. He sought an architect who could grasp the notion of an indigenous building designed with a regional style appropriate for a mountain setting. Frustrated with his inability to find such an architect, Grove entrusted the construction and design to his son-in-law, who had no architectural experience. The result was the still popular Grove Park Inn, a massive hotel made of native uncut granite boulders laid over a reinforced concrete frame. Grove's son-in-law ignored the currently popular styles that characterized most of the downtown buildings in Asheville. The materials from which the hotel was constructed were taken in large part from the mountain on which it stands. Huge boulders which form the walls of the hotel, some weighing up to five tons, were brought to the site by trains of 15 wagons carrying over 40 tons of stone each trip. Although Asheville's reputation as a resort for the wealthy was well known, its appeal for the middle class traveler seeking relief from summer heat was also widespread. 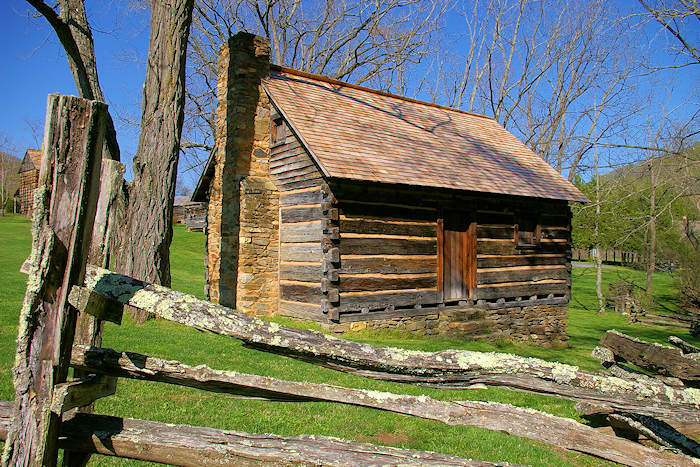 The Thomas Wolfe Memorial Home is an example of the boarding houses that sprang up in Asheville to accommodate the visitor of more modest means. The large 19-room Queen Anne style house had drafty, high-ceilinged rooms and a rambling, unplanned appearance. 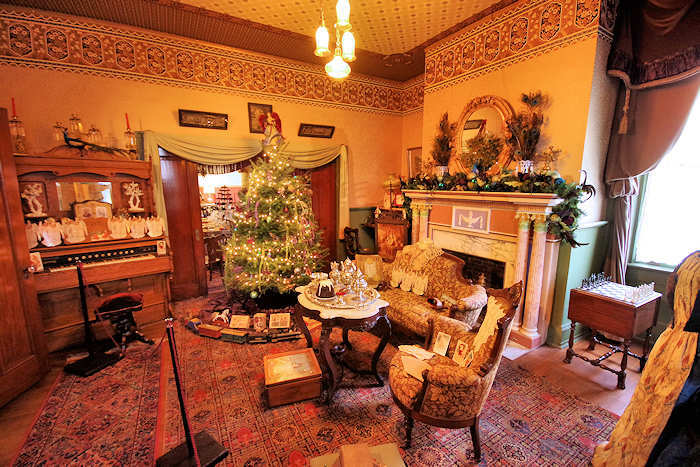 Built in the early 1880s, it is one of the oldest residences surviving in the downtown area. Wolfe, Asheville's most famous native son, immortalized the house in "Look Homeward, Angel," a novel which is mostly autobiographical. The house, named Dixieland in the work, is the setting for the experiences of the author as a young boy growing up in his mother's boarding house. Although the all-too-vivid portrayal of Asheville and its citizens was considered so unflattering by locals that the book was banned from the city library, Wolfe's home is considered one of Asheville's most important and significant historical sites. At the core of any thriving Southern city, of course, is its church community. Asheville's great churches reflect the city's architectural heritage and the same caliber of excellence in design as the city's other landmarks, many of the churches sharing mutual architects and designers with the city's most significant structures. Three of Asheville's most famous churches were constructed during the l895 to 1925 time period. In Biltmore Village (a community established and built by Vanderbilt to house and support estate workers) the social and architectural focal point is All Souls Episcopal Church (1896). The extraordinarily complicated structure is designed in the shape of a Greek cross with a massive central tower. The church's memorial windows are made of opalescent glass using a pre-Gothic method which produced amazing richness and depth of color. The features of the building include pebbledash surfaces and expansive tile roofs. All Souls and much of Biltmore Village were designed by Richard Sharp Smith, a protégé of Biltmore House architect Richard Morris Hunt. Another architect involved in the Biltmore House project was a Spanish designer named Rafael Guastavino. Guastavino is also responsible for the legacy of St. Lawrence's Catholic Church (1909) in downtown Asheville, a structure employing two Spanish Baroque towers rising to a height of five stories. Each tower is capped with a parapeted wall enclosing a bulbous dome; each dome is sheathed with pink, green, brown and white tiles. Guastavino's own technique, "cohesive construction," was utilized in the St. Lawrence project. The church, considered a true architectural masterpiece, contains the largest unsupported tile dome in the United States, measuring 52 by 82 feet. The construction of the dome is a story in itself. Built without the use of scaffolding or shoring, Guastavino started at the outside walls and cemented in the tiles one at a time all around, subsequently building up the roof layers going into the center using the tile he had recently cemented in place as his working platform. Still, it is the flamboyant Art Deco style which Douglas Ellington brought to Asheville that perhaps remains most typical of the city. A native North Carolinian, Ellington left his signature throughout the downtown Asheville area, combining his love of color and design with his European training. One of the most notable results is the First Baptist Church (1925-26). An unusual early Italian renaissance form accented with Ellington's own Art Deco detailing, the church demands and receives admiration and attention. Ellington employed a gradation of colored mission tiles on the dome, ranging from green to dark red. Orange bricks, terra cotta moldings and pink marble combine in the walls. Retrospectively, it was fortunate that after Asheville's largest bank and five other financial institutions closed on November 20, l930, and after Buncombe County, the city of Asheville and the public school system lost almost $8 million, the city fathers did the honorable thing. 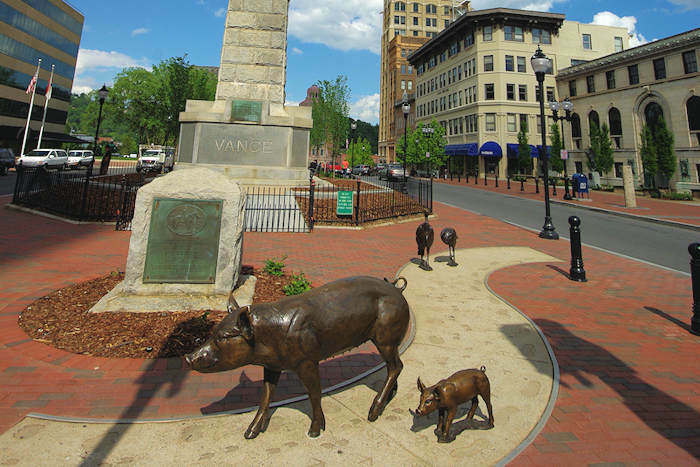 In 1936, Asheville refinanced its debt. And now the city's historic district of approximately 170 buildings stands as one of the most comprehensive collections of early 20th century commercial architecture in North Carolina.